6021 - ARMENIA medium flag shield souvenir embroidered patch. 2.5" wide x 2.75" tall. Patches sew or iron-on & are carded for a retail display for stores. 6044 - AUSTRALIA flag uniform or souvenir embroidered patch. 2" tall x 3.25" wide. Patches sew or iron-on & are carded for a display rack for stores. 6041 - AUSTRALIA medium flag shield souvenir embroidered patch. 2.5" wide x 2.75" tall - Patches sew or iron-on & are carded for a retail display. 6051 - AUSTRIA medium flag shield souvenir embroidered patch. 2.5" wide x 2.75" tall - Patches sew or iron-on & are carded for a retail display for stores. 6061 - BAHAMAS medium flag shield souvenir embroidered patch. 2.5" wide x 2.75" tall - Patches sew or iron-on & are carded for a display rack for stores. 6063 - BANGLADESH medium flag shield souvenir embroidered patch. 2.5" wide x 2.75" tall - Patches sew or iron-on & are carded for a display rack. 6071 - BARBADOS medium flag shield embroidered patch. 2.5" wide x 2.75" tall. Patches sew or iron-on and are carded for a retail display for stores. 6081 - BELGIUM medium flag shield souvenir embroidered patch. 2.5" wide x 2.75" tall. Patches sew or iron-on & are carded for a display rack for stores. 7051 - BELIZE medium flag shield souvenir embroidered patch. 2.5" wide x 2.75" tall - Patches sew or iron-on & are carded for a display rack for stores. 6981 - BERMUDA medium flag shield souvenir embroidered patch. 2.5" wide x 2.75" tall. Patches sew or iron-on & are carded for a display rack for stores. 6091 - BOLIVIA medium flag shield embroidered patch - 2.5" wide x 2.75" tall - Sew on or Iron-on. Patches are carded for a display rack. 6096 - BOSNIA medium flag shield embroidered patch. 2.5" wide x 2.75" tall - Patches sew or iron-on & are carded for hanging on a rack display for stores. 6598 - BOTSWANA medium flag shield embroidered patch. 2.5" wide x 2.75" tall - Patches sew or iron-on & are carded for a rack display for stores. 6101 - BRAZIL medium flag shield souvenir embroidered patch. 2.5" wide x 2.75" tall - Patches sew or iron-on & are carded for a display rack for stores. 6321 - BRITISH VIRGIN IS. medium flag shield embroidered patch. 2.5" wide x 2.75" tall. Patches sew or iron-on and are carded for a retail display for stores. 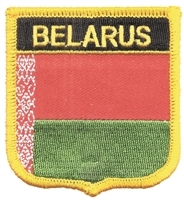 7196 - BULGARIA medium flag shield souvenir embroidered patch. 2.5" wide x 2.75" tall. Patches sew or iron-on & are carded for a display rack for stores. 7394 - BURMA medium flag shield souvenir embroidered patch. 2.5" wide x 2.75" tall, Patches sew or iron-on & are carded to hang on a display rack for stores. 7121 - CAMBODIA medium flag shield embroidered patch. 2.5" wide x 2.75" tall - Patches sew or iron-on & are carded to hang on a display rack for stores. 7041 - CAMEROON medium flag shield souvenir embroidered patch. 2.5" wide x 2.75" tall - Patches sew or iron-on & are carded for a display rack. 6115 - Canada crossed USA flags souvenir embroidered patch. 3" tall x 3.875" wide - Patches sew or iron-on & are carded for a display rack for stores. 6111 - CANADA medium flag shield uniform or souvenir embroidered patch. 2.5" wide x 2.75" tall - Patches sew or iron-on & are carded for a retail display for stores. 6116 - CANADA wavy flag ribbon souvenir embroidered patch. 1.75" tall x 4.75" wide. Patches sew or iron-on & are carded for retail display for stores. 7197 - CAPE VERDE medium flag shield patch. 2.5" wide x 2.75" tall - Patches sew or iron-on & are carded for a display rack for retail stores. 6610 - CAYMAN ISLANDS medium flag shield souvenir embroidered patch. 2.5" wide x 2.75" tall - Patches sew or iron-on & are carded for a display rack for stores. 7192 - CHAD medium flag shield embroidered patch. 2.5" wide x 2.75" tall - Patches sew or iron-on & are carded for a retail display for stores. 6121 - CHILE medium flag shield souvenir embroidered patch. 2.5" wide x 2.75" tall - Patches sew or iron-on & are carded for a display rack for stores. 6131 - CHINA medium flag shield souvenir embroidered patch. 2.5" wide x 2.75" tall - - Patches sew or iron-on & are carded for a retail display for stores. 6141 - COLUMBIA medium flag shield souvenir embroidered patch. 2.5" wide x 2.75" tall - Patches sew or iron-on & are carded for a display rack for stores. 7171 - CONGO medium flag shield embroidered patch. 2.5" wide x 2.75" tall - Patches sew or iron-on & are carded for a display rack for stores. 6743 - COOK ISLANDS medium flag shield souvenir embroidered patch. 2.5" wide x 2.75" tall - Patches sew or iron-on & are carded for a display rack for stores. 6151 - COSTA RICA medium flag shield souvenir embroidered patch. 2.5" wide x 2.75" tall - Patches sew or iron-on & are carded for a display rack for stores. 7091 - CROATIA medium flag shield souvenir embroidered patch. 2.5" wide x 2.75" tall - Patches sew or iron-on & are carded for a display rack for stores. 6161 - CUBA medium flag shield souvenir embroidered patch. 2.5" wide x 2.75" tall - Patches sew or iron-on & are carded for a display rack for stores. 5981 - CYPRUS medium flag shield souvenir embroidered patch. 2.5" wide x 2.75" tall - Patches sew or iron-on & are carded for retail display rack for stores. 6171 - CZECH REPUBLIC medium flag shield souvenir embroidered patch. 2.5" wide x 2.75" tall - iron-on backing. Patches are carded to hang on a display rack. 6185 - Denmark crossed USA flags souvenir embroidered patch. 3" tall x 3.875" wide - Patches sew or iron-on & are carded for a display rack for stores. 6181 - DENMARK medium flag shield souvenir embroidered patch. 2.5" wide x 2.75" tall - Patches sew or iron-on & are carded for a display rack for stores. 6186 - DENMARK wavy flag ribbon souvenir embroidered patch. 1.75" tall x 4.875" wide - Patches iron-on backing & are carded for a display rack for stores. 6803 - DOMINICA medium flag shield - 2.5" wide x 2.75" tall - Patches sew or iron-on & are carded for a display rack for stores. 6641 - DOMINICAN REPUBLIC medium flag shield souvenir embroidered patch. 2.5" wide x 2.75" tall - Patches sew or iron-on & are carded for hanging on a rack display for stores.